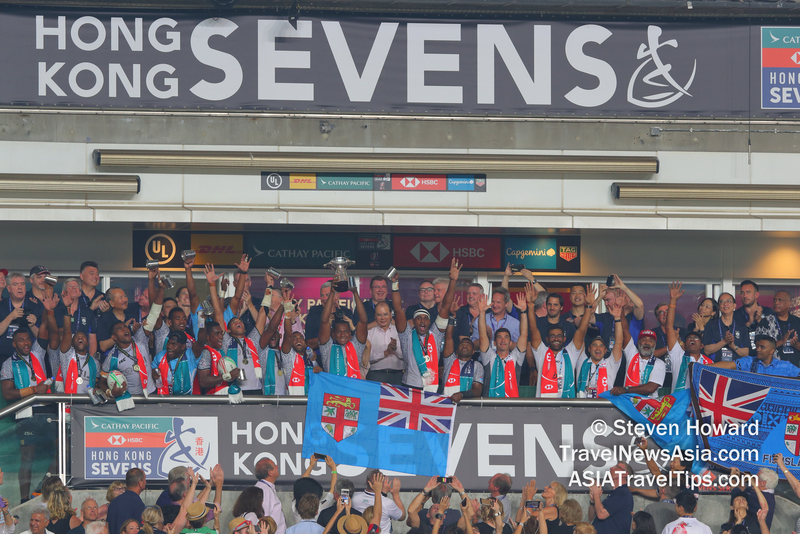 Fiji made history on Sunday by winning their fifth consecutive Hong Kong Sevens title with a 21-7 victory over France in the Cup Final. The USA, who were without a couple of key players, claimed third place to maintain their lead in the HSBC World Rugby Sevens Series standings with just three rounds remaining. Over the course of three scintillating days of action played out in front of over 100,000 fans at the Hong Kong Stadium, Gareth Baber's side enthralled the crowd as they achieved something that no other nation has ever done. After their silver medal in Vancouver, France continued their fine form by reaching their second successive Cup Final in a season, something that they hadn't achieved before. After the break Fiji's 14-0 lead was tested when they went down to six players and France were awarded a penalty try. However, from 14-7, Fiji rallied and Tuimaba's second try ultimately ensured that history would be created in front of a sold-out crowd. "It's a fantastic feeling and I'm sure that it will sink in over the next two or three days," said Fiji's head coach after the full-time whistle. "I think that all of this has been in the backdrop of what happened in Christchurch, obviously our hearts and our thoughts go out to all of those families and this is a dedication to them." At the end of all ten rounds of this year's world series, the top four teams will qualify their places at the Tokyo 2020 Olympic Games. Japan are the only side currently qualified due to automatic qualification as the host nation. Earlier in the day, Argentina had toppled the back-to-back world series champions South Africa 19-17 in the fifth-place semi-final. In the other semi-final New Zealand got the better of England 17-10 and, at the end of the day, the UL Mark of Excellence was handed to the All Blacks Sevens co-captain Scott Curry. The award marked the solidarity shown to the side from a number of teams over the three days in response to the recent events that have affected the country. The manner of the narrow loss will have been tough for Japan to take, however their run to that point does have a positive outcome for them. The side's ability to reach that stage means that they move above Wales into 14th place in the world series standings. 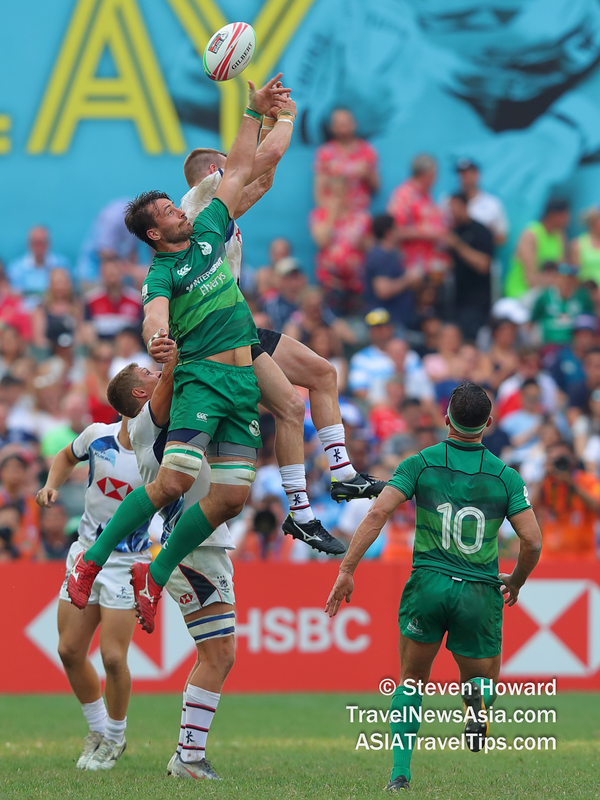 In three rounds' time, at the end of the world series, the side that finish in 15th position will be relegated with their place being taken by newly-promoted Ireland, who clinched their place on the 2020 series with victory over hosts Hong Kong earlier in the day. The HSBC World Rugby Sevens Series moves on to Singapore next weekend for the eighth round of the men’s series. With the series approaching its climax and those all important ranking points at stake in the race for Olympic qualification fans, can look forward to a hotly contested competition in Singapore. See latest HD Video Interviews, Podcasts and other news regarding: Cathay Pacific, HSBC, Hong Kong, Sevens, Rugby.